"Forever the People" is the follow-up book to "Getting High". The book charts the continuing success of Oasis as well as providing a fly-on-the-wall insight into the band's characters and their lifestyles. 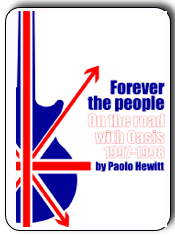 In September 1997 the writer Paolo Hewitt was invited by Oasis to accompany them for six months on their Worldwide Be Here Now tour. It was some trip. Starting in the UK and stretching right around the world, Hewitt was able to get closer to the band than any other writer. He followed the group literally from the hotel room to the stage, and back again. Forever The People is his intimate and gripping account of all the tour's drama. He writes of amazing gigs in Rio and court appearances in Australia. He details the band hanging out with the likes of Maradona, Johnny Depp and Naomi Campbell and he watches as three hotels and two airlines attempt to ban the group worldwide. Paolo reveals their unique humour and he perceptively illuminates the effect that life on the road extracts from all who undertake it. Forever The People is no mere hagiography of Oasis. As he observes, after the amazing success of their (What's the story) Morning Glory? album, Oasis was a 'band in search of meaning', a band that had been rocked by criticism of their Be Here Now album whilst busy fighting off new contenders for their crown. This is the story of how Oasis, saved themselves from themselves and found a future, found new horizons. PAOLO HEWITT update - Paolo summarises his thoughts on then and now. This is a new chapter previously unavailable. A fantastic recount of Oasis 1997 amongst the madness of the Be Here Now tour. This book has everything that is lacking from the uneventful `Lord Don't Slow Me Down' documentary and I finished this over a few days. Paolo Hewitt's day by day description of events are easy to read and despite his close relations with the band (though mainly Noel) he provides a balanced review of Oasis. I'm a diehard Oasis nut - I downloaded the sample - read it - loved it and made the purchase. I'd recommend all Oasis fans to skip straight to the purchase as this is an excellent bargain of a book.